It's that time of year when sore throats reign supreme. Add a blocked nose, throw in a cough and you have a recipe to spend the day in bed. Soup can be nourishing, warming and filling. 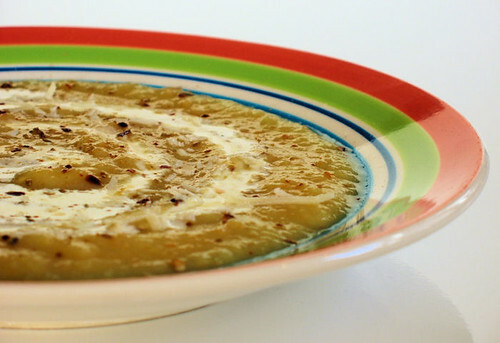 My mum used to make this soup when I was young, there is nothing fancy about it. It just tastes good and makes you feel a little better, especially when you can't face something more solid. Recipe from my Mum - thank you! Add 1 tablespoon of olive oil to a large saucepan and sweat the onion for about 5 minutes. Add the leeks and carrots and cook for about another 10 minutes until the vegetables are soft. Add the potatoes and enough water or vegetable stock to cover the potatoes. Bring to the boil, turn the heat down low and simmer for about 20 minutes until the potatoes are soft. If you used water instead of vegetable stock, add a teaspoon of vegetable stock powder or cube at this stage. Taste and add more if it needs it, then season with salt and pepper. Blend the soup in batches until it is smooth. Return to the saucepan to heat through. You may need to add some more water or stock at this stage if you want the soup to be a little thinner. Serve with freshly grated Parmesan cheese on top. You can add a swirl of cream if desired. Note: Sometimes when I make this soup I like to add a small chopped red chilli at the onion stage to give a little heat. BUT I don't recommend you do this if you are serving to someone who is poorly or has a sore throat! This soup is headed to an event called No Croutons Required, a monthly blogging event alternately hosted by Lisa's Kitchen and Tinned Tomatoes. The theme this month is "nourishing veggie soup" and is being hosted by Lisa's Kitchen. Thank you for your submission. Sounds like a tasty soup! Looks delicious! Perfect for a chilly night. I love the bowl too. It matches your blog header perfectly! There's nothing more comforting than a good bowl of healthy soup when you're not feeling well. Looks good! Thanks for sharing, Nic! This soup sounds really yummy! Nic, the recipe sounds like a powerhouse of nutrients, but the picture spells: yum. I hope you're not sick. :) Your soup looks so warm and comforting. Lovely click! looks so inviting! Soup looks delicious and those ingredients tend to always be in the fridge so very handy! It's so lovely to be back viewing your creations from my absence due to illness. I know it's a little late but wishing you & your family a Happy New Year! Can you believe I've never made soup before? Now I've got no excuse, this sounds so easy! I really love this soup, love it creamy vs traditional chunky. Dragon - no, I'm not sick but have had one of the kids off from school all week. That is a glorious and yes, easy soup, Nic. Hope the li'l one is getting better. My hubby LOVES soup - this is goin' on the list, Nic! Recipes from MUM are always the best, aren't they? This looks fantastic, sounds great.